Be very careful of any outside advice you receive from other physicians and/or current medical students, as information on the application process may change from year to year. The UNM School of Medicine Office of Admissions offers pre-med advisement to any students interested in applying to medical school. All students interested in setting up a one-on-one advisement appointment with one of the UNM School of Medicine Office of Admissions staff persons must first attend an advisement workshop. The Office of Admissions holds monthly advisement workshops to provide students with the basic information on applying to medical school. Please be aware that you will be required to attend a pre-med workshop before scheduling a pre-med advisement appointment with an advisor at the School of Medicine’s Office of Admissions. For applicants who attended the Post-Application Workshop and have scheduled an individual advisement session, please complete the Self Assessment Form and the Action Plan prior to attending the advisement appointment. You must bring the completed Action Plan with you to your advisement appointment. Please see the Example Action Plan for further reference. 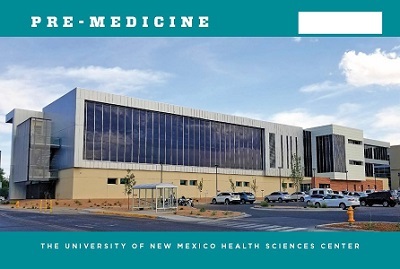 UNM Students can also receive pre-med advisement from The University of New Mexico's University College or the College of Arts and Sciences.